Potentiometers (also called pots) are variable resistors, used as voltage or current regulators in electronic circuits. By means of construction, they can be divided into 2 groups: coated and wire-wound. With coated potentiometers, (figure 1.6a), insulator body is coated with a resistive material. There is a conductive slider moving across the resistive layer, increasing the resistance between slider and one end of pot, while decreasing the resistance between slider and the other end of pot. 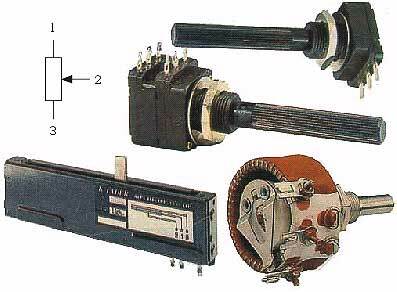 Wire-wound potentiometers are made of conductor wire coiled around insulator body. There is a slider moving across the wire, increasing the resistance between slider and one end of pot, while decreasing the resistance between slider and the other end of pot. Coated pots are much more common. With these, resistance can be linear, logarithmic, inverse-logarithmic or other, depending upon the angle or position of the slider. Most common are linear and logarithmic potentiometers, and the most common applications are radio-receivers, audio amplifiers, and similar devices where pots are used for adjusting the volume, tone, balance, etc. Wire-wound potentiometers are used in devices which require more accuracy in control. They feature higher dissipation than coated pots, and are therefore in high current circuits. Potentiometer resistance is commonly of E6 series, including the values: 1, 2.2 and 4.7. Standard tolerance values include 30%, 20%, 10% (and 5% for wire-wound pots). Potentiometers come in many different shapes and sizes, with wattage ranging from 1/4W (coated pots for volume control in amps, etc) to tens of watts (for regulating high currents). Several different pots are shown in the photo 1.6b, along with the symbol for a potentiometer. The upper model represents a stereo potentiometer. These are actually two pots in one casing, with sliders mounted on shared axis, so they move simultaneously. These are used in stereophonic amps for simultaneous regulation of both left and right channels, etc. Lower left is the so called slider potentiometer. Lower right is a wire-wound pot with a wattage of 20W, commonly used as rheostat (for regulating current while charging a battery etc). For circuits that demand very accurate voltage and current values, trimmer potentiometers (or just trim pots) are used. These are small potentiometers with a slider that is adjusted via a screwdriver. Trim pots also come in many different shapes and sizes, with wattage ranging from 0.1W to 0.5W. Image 1.7 shows several different trim pots, along with the symbol. Resistance adjustments are made via a screwdriver. Exception is the trim pot on the lower right, which can be adjusted via a plastic shaft. Particularly fine adjusting can be achieved with the trim pot in the plastic rectangular casing (lower middle). Its slider is moved via a screw, so that several full turns is required to move the slider from one end to the other.